TMC Blog: Our collaborative think tank hub. TMC5 is coming! October 20-21, 2017, Winnipeg, Manitoba. "Through the implementation of the library learning commons model, there will be more opportunities for wisdom to be cultivated, shared, and applied to students’ learning, and in the development of effective teaching and learning approaches." "The entire school community should be a safe and supportive environment for all learners to develop, understand and value their own identity as well as the identity of others. The school library learning commons can be very instrumental in setting the tone for self-discovery and inclusiveness." "Changing our practice as educators often requires changes in the way we think about the world, that is, changes in our often-unexamined assumptions about what is reality. The work of considering new-to-us theoretical frameworks and discourses is difficult and often uncomfortable." This paper details a research study focused on inclusion of LGBTQ literature in school library collections, specifically picture book depiction of family; and the challenges, concerns and best practices teacher-librarians face in developing inclusive collections. Research literature, components, methodology, results and references are shared along with an extensive list of LGBTQ titles studied across several provinces. Ms. Brown presents a fascinating look at an important and sensitive topic, with hope that library staff will continue or commence to work with their learning communities “to build collections inclusive to all”. Teacher-librarian Jennifer Brown writes and reflects about the potential of the library learning commons design and practice to address equity and social justice in co-planning learning and teaching experiences, as well as shares the developed concept of an “open maker forum” for students. Brown includes reflective questions and resources for teacher-librarians to help build capacity in addressing equity and social justice, and provides two recent library learning commons project examples accompanied by illustrative photos: 1) a staff wide inquiry into embedding First Nation, Métis and Inuit perspectives in practice, and 2) a daily open learning opportunity for student voice in the makerspace movement. Enjoy this on site video of transformations Carlo Fusco has made to address building a Culturally Relevant and Responsive School Library Learning Commons learning community. Campbell and King share their work in Upper Grand District School Board to address equity and access to eLearning for all learners but especially at risk adolescents. How can we help every student grow to be informed and active Canadians and global citizens? What starts out as a family ‘Canada 150’ project soon morphs into a teaching and learning challenge for Diana Maliszewski. Enjoy this personal research journey through the conflicts and biases uncovered in some typical school library secondary sources and keep pace with the discoveries of alternate perspectives due to ‘real life’ incidents and then on to new revelations prompted by social media postings. Maliszewski then relates how she plans to take her own learning into the design of lessons for her classes. Only Maliszewski ends up with many still unsolved questions. Please add comments to this page if you have ideas and suggestions for her next steps. "With 19% of Canada’s population living in rural areas, there is an urgent need for resources and training to support students attending school in rural settings. Connections-based learning addresses many of the inequities rural students face by leveraging our connected world to cultivate meaningful relationships with others, as we partner locally and globally, learn with experts, support organizations, and serve our communities"
“What happens when you pair a teacher-librarian with an Aboriginal teen?” In this paper you will discover the process and result of one such delightful collaboration resulting in the creation of a picture book about the prairie’s famous Chinooks, Chinook and Winter, written by teacher-librarian Rhonda Hunter and illustrated by high school student Jayce Lamontagne. Hunter presents the backgrounds of both writer and artist, incorporating technology effectively in the process, and encouraging educators to consider such collaborations in all schools. In her paper Pat Trottier shares many school projects and initiatives where relationship building had a very positive impact on teaching and learning. Teachers and students built stronger connections and parents and other community members were important partners in learning to understand and appreciate each other. Trottier relates how her diverse school community came together, over a two year period, as a culturally responsive learning community with the Library Learning Commons central to all programs. "A number of staff members had some legitimate concerns; a) they did not want to offend and b) they did not want to appropriate. Outside of the curriculum, they felt that they did not know enough about Indigenous culture and history to be able to effectively share these perspectives. They wanted to know what activities and teaching approaches were culturally sensitive and appropriate and which were not. I acknowledged these concerns and agreed to learn more myself and share what I learned at the next division meetings in June. I had homework to do." TMC 2017 Papers are published on a Google site to promote collaborative study and dialogue. Papers are peer reviewed and posted as soon as possible. More are coming so keep revisiting the site. The papers have been posted according to the four subthemes of this symposium however the editors acknowledge that many papers actually connect across more than one theme. Each paper has its own page complete with information about the author and a brief summary of the work. At the bottom of the page a PDF of the paper is attached for you to study. As you read you can add comments for the author in the comments section under the PDF Paper. The authors will appreciate your thoughts, questions and additional ideas and links and we encourage our authors to respond to comments. All paper writers and attendees at TMC5 in Winnipeg will have access to make comments if we have your gmail address. We hope that everyone will read as many papers as possible before coming to the symposium in Winnipeg because we will not have time during the event. If you are not able to attend in person we would still appreciate your comments. NOTE: You need to sign into this site with your Google account to add comments to the papers. Look for the 'Sign In' tab at the bottom of Home Page'. Are you participating in TMC5? We invite you to use this badge on your website, blog or social media channel. 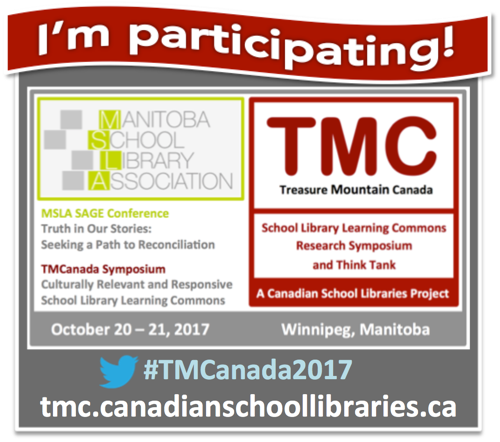 It's time to register for TMC5 and the MSLA Conference! 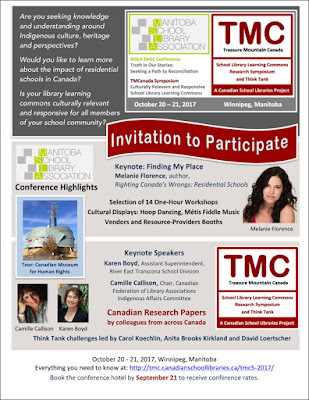 The program for the Manitoba School Library Association's SAGE conference is now available! Canadian School Libraries is partnering with MSLA, aligning our TMC5 symposium with this MSLA professional learning event. We invite you to register for both events! 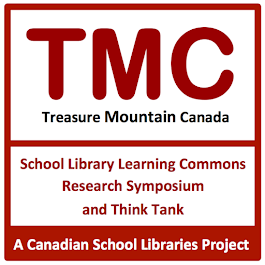 The TMC5 theme, Culturally Relevant and Responsive School Library Learning Commons, builds on ideas from MSLA conference theme, Truth in Our Stories: Seeking a Path to Reconciliation. Have a look at the MSLA conference program. Learn more about TMC5, including how you can register for the symposium or for both events. TMC5 Registration in now open! Registration for TMC5 is now open! 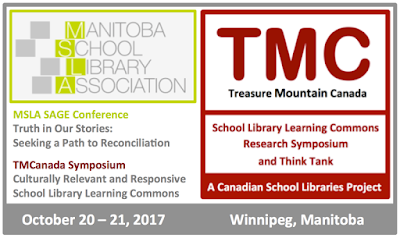 Canadian School Libraries is very pleased to be hosting TMC5 in partnership with the Manitoba School Library Association's SAGE Conference. This is a great opportunity for TMC participants to attend both events! When you register for both, you will receive complimentary admission to our special tour of the Canadian Museum for Human Rights. Friday October 20, 7:00-9:00 pm & Saturday October 21, 8:30-3:00 pm. * The Kick-off Dinner, continental breakfast and lunch are all included in the registration fee. Options available for half day attendance. Lunch is provided for those who register before October 15. Canadian Museum for Human Rights Tour: $20.00. FREE if you register for both SAGE and TMC5. 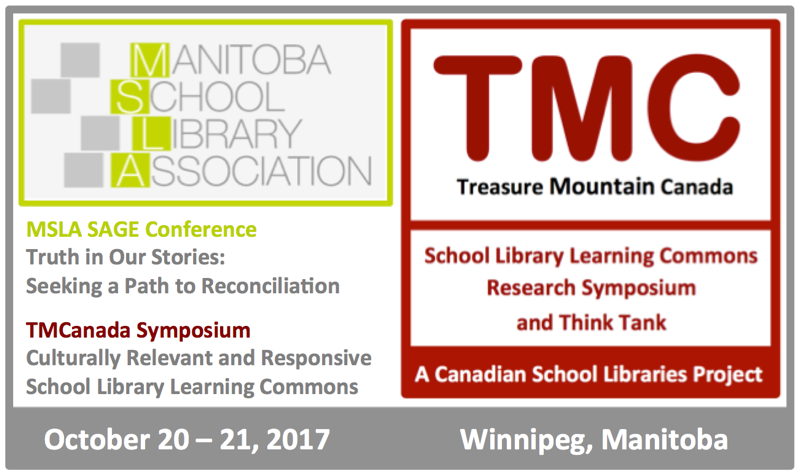 Registration is provided by the Manitoba Teachers' Society (MTS). You do not need to be an MTS member to use the system. 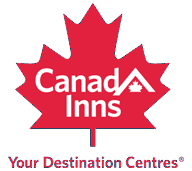 Canadian School Libraries has booked a block of rooms at Canad Inns at a special conference rate. Connect to our Culturally Responsive SLLC webpage for resource links to get you thinking about the theme. Visit the TMC Website for complete information about this symposium and past events. Who am I? Who are we? These age old questions have generated study and philosophical conversations for centuries and remain important today as a basis for building for the future. This fall at TMC5 in Winnipeg, Manitoba school library leaders and practitioners will gather to study the role library learning commons can play in helping learners find their place and make sense of their worlds by exploring papers, interacting with guest speakers and collaborative work based on the theme of Culturally Relevant and Responsive School Library Learning Commons. Working together we will uncover opportunities, challenges and possibilities to enable fostering a culturally relevant and responsive school library learning commons. How can we enable every student to see themselves and their community? Who can we collaborate with to ensure students gain many perspectives? What stories do our learners need to hear? How can we help our learners build deep knowledge of communities and caring of others? How can we incorporate the power of the arts to broaden student cultural knowledge? How can technologies help to connect students to real worlds and experiences? Why is it important to take a lead on issues of diversity, equity and inclusiveness? Explore a few resources to get you thinking about culturally relevant and responsive school library learning commons. What are the opportunities, challenges and possibilities you are pondering? 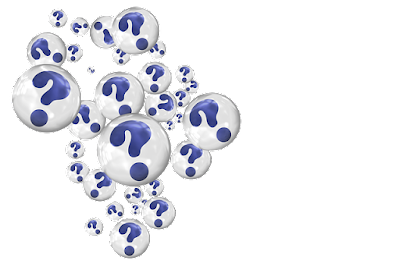 What questions would be useful for you to explore? Check the TMC website and plan to participate. We need your stories, research, strategies and observations to collectively build voice for the future work of school libraries. Papers are required by October 1, 2017. Attendance at the symposium is not a requirement; for those who cannot attend the actual event, we invite conversations via our blog http://tmcanada.blogspot.ca/ and Twitter, using the hashtag #tmcanada2017. For planning purposes, please let us know if you hope to submit a paper. If you have any questions or wish to discuss this initiative further contact Carol Koechlin by email or by phone (416-751-0889), or contact any member of the planning committee. Watch for more details coming soon regarding the TMC5 program and registration information on the TMC website. Planning is well underway for the fifth Treasure Mountain Canada research symposium and think tank, taking place October 20 and 21, 2017 in Winnipeg, Manitoba. 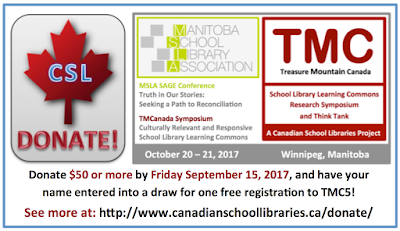 Canadian School Libraries is very pleased to be partnering with the Manitoba School Library Association to hold TMC5 in conjunction with its annual SAGE Conference. Please visit the new TMC website for information about how you can participate in TMC5, and resources related to the symposium's theme, Culturally Relevant and Responsive School Library Learning Commons. Please share with this hashtag! The website has been archived. Click above for the new site. Twelve Mile Coulee L.C. Maker space and more.